Today, companies are keen to organize fundraiser drives, charity walks, and other social events because it generates a huge impact on the crowd. Fundraiser magnets are gaining popularity than ever because it helps corporate businessmen to display their strong affiliation to the cause. A full color social awareness magnet 4×5.75 would easily become an enchanting fundraiser token for businesses, trying to build their strong social persona. Fundraiser magnets are perfect for value building during tradeshows, social events, and other programs. Magnet advertising is a very broad and unique term used for advertising through magnets. Today, marketers have preference to select from a broad selection of square and rectangle magnets, custom die cut magnets, custom shaped magnets and more. Calendar magnets are the brilliant transformation of custom rectangle and square magnets. These customized magnets are sought by businesses for business gifting at the start of the year or in the mid year. 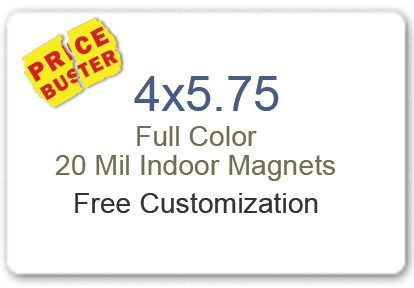 4x 5.75 magnets are perfect for tradeshow gifting and selling bulk mailers. Marketers can even employ customized calendar magnets for awareness generation during about a social cause or other important event. Customized 4×5.75 magnets can be employed for pushing sales such as discount coupons, sale offers, special marketing event, etc. People would love to retain money saver magnets over their refrigerator door and they would discuss the brand with everyone else. What does that mean? Brand advocacy means building value for your business through various mediums. Marketers can drive brand advocacy campaigns by gifting away these customized magnets 5.75 x 4 to their clients and asking them to speak of brand in a lighter tone. For example – Receive $10 on each purchase made by your referral or Receive recharge worth $10 after making two of your friends join our website. Brand advocacy is in infantry stages, but it is driving corporations or businesses crazy. They are seeking various ways of making peace with their customers. It doesn’t cost bombs to say thanks, only it takes a large heart to say thanks to your customers, clients and loved ones who make difference to your business. You can easily highlight your friendly side by printing six letter words Thanks or Expecting your Cooperation in the future in full colors over these customized magnets. Now what does that mean? It means influencing people to make resolutions for their New Year. Customized magnets 4×5.75 asking people to make resolutions would be appreciated and they stand high chances of long-term exposure. This type of promotional tactic is well suited for health and wellness marketers, food marketers, and luxury lifestyle brands. People would appreciate this gesture with whole heart. There are many more ways of extending brand personality with customized 4 x 5.75 magnets and marketers can experiment them over these custom magnets. Avail benefits of free full color printing, free online design proof, free art setup, and free shipping on purchasing these personalized magnets from any reputed ecommerce store selling them.